What’s left and what’s right? Usually it is obvious, but sometimes you have to take a step back and consider the bigger picture. For example, the Toronto toll debate has exposed a lack of scrutiny of the leading source of corporate profit over the past century by many supposed leftists. Absent a political economy of the auto industrial complex, many Marxists have objectively allied themselves with the private car’s awesome political, cultural and ideological power. The tolls are no doubt a terrible idea. Anyone serious about livability, pollution, safety, lack of exercise, weakening corporate power or the climate crisis should demand both the Gardiner and DVP demolished. (41% of Toronto’s greenhouse gas emissions are from land transportation and despite dropping 24% in other sectors between 1990 and 2013 transport emissions rose 15%.) 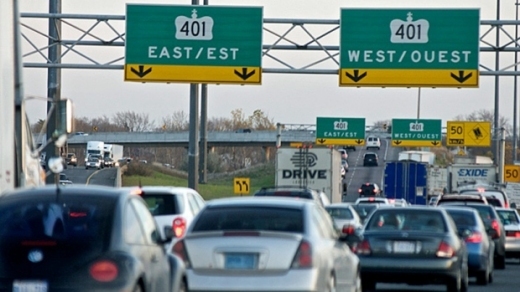 But, since getting rid of these expressways isn’t on the agenda, forcing drivers to pay a Tooney is a small jab at the ‘God-given right’ to take 3,000 pounds of metal 10, 30, 50, or 100 km a day without paying any road costs. The stated plan is to spend the money raised on “transit” infrastructure. However much is channelled to Toronto Transit Commission projects will be socially useful while the funds devoted to roadway will not. One objection cited to tolling the highways is that it would simply push vehicles on to alternative routes. It’s possible, but increasing costs or making driving less comfortable generally curtails car travel. The primary “left” criticism, explains Loreto, is that it’s a “flat tax that roots out those who can pay from those who can’t pay.” To the extent lower income folks take these two highways that’s correct, but driving and income are inversely correlated. Poorer people own fewer vehicles and drive less. Calling a toll a “flat tax” is a tacit acceptance of a transport system where roads, highways and parking are endlessly subsidized (through public funds or hidden in prices everyone pays in higher store prices, rent, etc.). Few call fees at Canada Post, the Liquor Control Board of Ontario, Sasktel, Toronto Hydro, Toronto Transit Commission, etc. a “flat tax”. Yet, at least hydro is a greater necessity – to cook or stay warm – than driving a highway. Left-wing opposition to tolls disregards the longstanding financial incentives, notably road and mortgage subsidies, for people to purchase large single-family suburban homes. But, it’s also a brazen denial of auto hegemony. Toll critics act as if their opposition doesn’t contribute to rightists’ wild attacks against bike paths, trolleys, car-free days, etc. It’s as if former mayor Rob Ford didn’t denounce a supposed “war on cars” and the leader of the provincial Conservatives isn’t seeking to restrict Toronto’s right to raise revenue from its own highways by saying the move would “start a war of tolls” between Ontario municipalities (amen to that). Objectively, toll opponents are taking the side of the auto industrial complex — car, oil, tire, asphalt, insurance, etc. companies, as well as big box retailers, appliance makers and suburban developers — having fallen victim to the car’s immense ideological/cultural/political power. Since the early 1900s the auto industrial complex has funded consumer groups and university programs. The highly profitable sector has also produced films, pamphlets and books promoting roads and depicting automobiles as a barometer of progress. Far and away the largest advertisers, car companies have conquered nearly every sphere of human consciousness. Whether you’re at a party, online, at the mall, playing videogames, at the movies or writing checks, there is an endless promotion of both brand names and automobility. The auto industrial complex is a powerhouse of colossal proportions in their dealings with the media. “Top auto executives hold frequent, off-the-record meetings with the nation’s leading publishers and editors, enjoying a level of access that most politicians can only dream of,” writes Keith Bradford former Detroit bureau chief of the New York Times. When unhappy with editorial decisions car companies have repeatedly pulled their advertising. Disregarding the political climate when criticizing tolls is highly disingenuous. It’s akin to those who oppose university fees for women’s centres without discussing patriarchy or criticizing First Nations tax breaks without mentioning the land theft, pass system, residential schools, etc. Simply put, blanket condemnation of tolls reinforces an unjust, unhealthy and ecocidal transport/urban planning status quo. Most leftists opposed to the tolls say they support expanding public transit. To overcome private automobility we unquestionably need major investments in new light rail, metro lines, bus lanes, bike paths, as well as incentives for employment near transit, car free streets and an end to car centric zoning. But, the car won’t be dethroned without also increasing its costs (be it highway or street tolls, luxury vehicle fees, registration fees, parking fees, higher gas taxes, etc.). The short term financial inequities of some of these measures can be mitigated through tax rebates, as well as free transit passes, prioritizing transit services in working-class neighborhoods and building social housing near transit hubs. To be “progressive” in 2016 must include a political commitment to upending a transport/urban planning system structured around the private automobile. This article was posted on Friday, December 16th, 2016 at 9:39pm and is filed under Canada, Communism/Marxism/Maoism, Transportation.